Image if you can, a real log fire crackling in the grate, seasonal lights twinkling on the Christmas tree and the crisp fresh snow outside covering the world like a great white blanket. Whilst inside snuggled up on the sofa keeping warm from the glow of the fire you are starring into the television set lost in the magical world of the animation film “The Snowman” by Raymond Briggs. Not only does this classic film draw anyone that watches it into a far away place of adventure but it also brings out the child in adults when it comes to collecting anything and everything associated with it. The book, The Snowman was first published in 1978 and was just one in a long line of books made famous by the children’s writer and illustrator Raymond Briggs. The animation film was later released in 1982 and caught the hearts of thousands of children around the world. With no dialogue just genius animation not only did its signature tune “I’m walking in the Air” storm the music charts in 1985 when sung by Aled Jones but even up until present day this character has been one of the most popular figures for manufacturers to create everything from ceramic figures to jigsaws depicting his image. This is why, quite possibly, The Snowman is one of the most popular and sought after collectables of today. 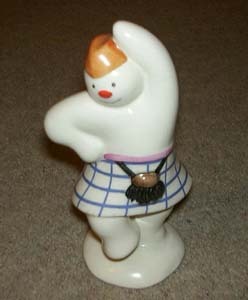 Royal Doulton held the licence and were the first ceramic company to produce a range of sculptured figures based on this loveable character in 1985. The first range ran for just nine years as unfortunately they did not sell as well as expected. Now all of these figures and associated items are a must for snowmen collectors all over the world. The hardest figure to track down is “The Skiing” snowman DS21 as it was made for just 2 years from 1990 to 1992. Up until recently this was the sculptured figure that commanded the highest premium on the secondary market but just recently a one-off “Highland” snowman DS7 made an astounding £810 on an internet auction as it was missing its red colouring on its kilt. 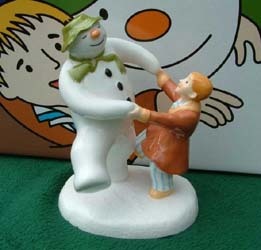 With the snowman pieces suddenly growing in the collectables secondary market Royal Doulton issued a new range of limited edition sculptured figures in 1999, one being the first tableau every made “Dancing in the Snow” in a limited edition size of 2,500. It melted the hearts of many collectors the day that Royal Doulton issued their final ceramic figure “The Journey Ends” last year and it sold out almost immediately as collectors believed this to be the final figure available to them. Fortunately this was not to be the case or the end of the journey for collectors as a host of other collectable treasures became available on the market for the avid snowman collector. Coalport acquired the licence to produce ceramic snowman products and since 2001 have issued both general release and limited edition pieces. The first limited edition “Christmas Friends” has long since sold out and now reaches as much as £600 on the secondary market, even more than the Doulton Skiing Snowman. With such huge demand Coalport have continued successfully to produce more Limited Edition pieces, such as “Hold on Tight”, “Walking in the Air” and “By The Fireside. All three were sold out straight away and are already making double to triple their retail value on the secondary market. Snowman glitter globes have also proved popular and apart from being extremely collectable make the perfect Christmas accessory. It is not just the sculptured figures that create such a frenzy amongst the collectors of Coalport snowmen, the Annual plates, ceramic calendar’s and glitter globes to mention but a few also have a huge following.